We are among the manufacturer and supplier Lat Pulley. 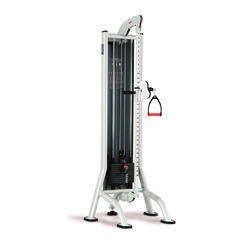 Offered product is used in both domestic and commercial gyms for performing various exercises. Stringent quality tests are performed on this product before it is finally released for sale. Marketed product has features such as longer service life, classy designs and attractive shades. 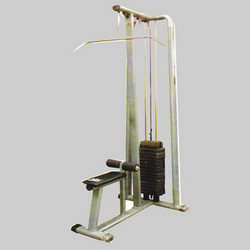 This is a rock solid lat pull down machine with high and low pulley. Made from steel tubing painted beautiful. foam rollers keep you comfortably planted to the ground as you load up heavy weights. A must have for any home gym or anyone serious of strength training. These can be used with two bands or one band according to the resistance required. HIgh Low Pulley as it is called. It is a compkete machine for all your Bicep & Tricep Needs. - Net Wt. - 225 Kgs. We are Let Pully Machine manufacturers in In Gujarat and Ahmedbad specially. Being a customer oriented organization; we are deeply engaged in offering a wide array of High Lat Pulley. We are offering High Lat Pulley to our clients.